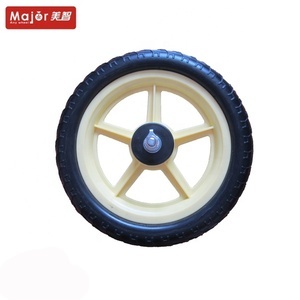 Specification: Name 6''7" EVA foam wheel for shopping cart/children's bicycle wheel Tire size 150X33 Tire type EVA tire Usage baby carrier wheel/baby cart wheel/baby stroller/pram wheel/wheelchair Tire diameter 150mm Tire width 33mm Hole diameter as your requirment Hub length as your requirment Tread pattern see the picture Rim size 110mm Tire material EVA Rim material PP Tire color any color Rim color any color Bearing type nylon/ carbon steel bearing/ball bearing Weight 200g Load 20kg Package: Packaing 10pcs/woven bag or as your requirment Shipping Pointed agent forwarder,our agent forwarder,both are ok Delivery time 30days/20GP 40days/40GP 45days/40HQ Quantity according the reality Our service: sample If we have storage,it's free for you OEM We accept it and welcome it. after-service Any question,any doubt,we will communicate with you positively Company information: Welcome to our factory!!! sample shop: work flow: Manufacturing shop: Brief introduction: Qingdao Winners Corporation ( International Trading company ), Qingdao Newkings Corporation ( Domestic Production industry ) was established in 2005. High quality is what we are persuing,which is the most important feature in our We are specialized in manufacturing any size of PU Foamed Tires ,from 6 inch to 12 inch for baby stroller wheel,balance bike wheel,from 12inch to 20 inch(x1.75 and so on) for bike tire,tool cart wheel,from 20inch to 700mm(x1.75 and so on)for bike wheel,racing wheel,(see the rims below)from 6 inch to 18 inch(like 3.50-8.18x8.50-8) for wheelbarrow wheel,air compressor wheel,gargen wheelbarrow wheel,lawn mower generator wheel,cleaning machine wheel,handtrolley wheel,tool cart wheel,mixer wheel and other machine wheel. Each spare wheel has a 20mm bore and comes complete with inner tube which can be easily accessed through the split wheel. 1)select equipment model 2)design and manufacture products according to clients' special request 3)train technical personnel for clients. 3. we have our own technical department & could produce various new models as per Customers special requirement. 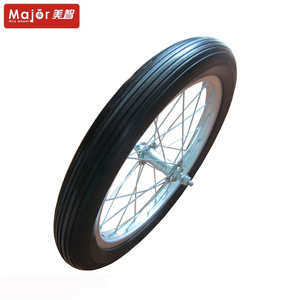 ,LTD, specializing in manufacture wheelbarrow, rubber wheel, tire and tube etc. We have 1 2 years experience on this line, and have been working with more than 70 countries and areas client in the world. We are very confidence in supply each client good quality product with lowest price, fast delivery and best service, Welcome you to contact us with your inquiry very much! 2. Well carrying capacity. 2. Professional workers with good work attitude. Please choose your need size and quantity for me. , Ltd is a professional manufacturer for air free wheel. 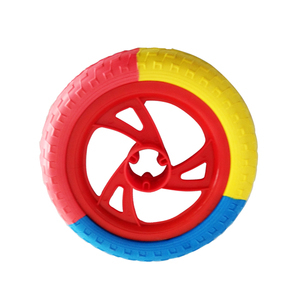 We also product and sale composition material for PU foam wheel. Quality first, customer superme" is our preserving management ideas. * Supply PU foam wheel, PU foam tire, flat free wheel, flat free tire, flat free PU foam wheel, foam wheel, foamed tire, handtruck wheel, wheelbarrow wheel. * Many kinds of tread patterns, rims, bearings and colors for your choice. * With good quality and reasonable price. 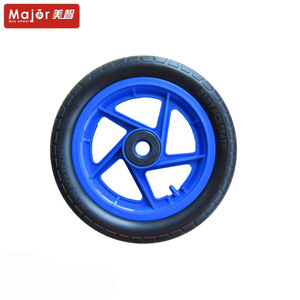 Specification: Name plastic solid pu foam bicycle wheel for garden cart 20x1.75 Tire size 20x1.75 Tire type PU tire Usage bicycle/wheelchair/tool cart/food cart/a la cart/garden cart Tire diameter 500mm Tire width 44mm Hole diameter as your requirment Hub length as your requirment Tread pattern Y tread Rim size 400mm Tire material rubber Rim material Nylon Tire color any color Rim color any color Bearing type nylon/ carbon steel bearing/ball bearing Weight 1.80kg Load 180kg Package: Packaing 10pcs/woven bag or as your requirment Shipping Pointed agent forwarder,our agent forwarder,both are ok Delivery time 30days/20GP 40days/40GP 45days/40HQ Quantity 2016pcs/20GP 4399pcs/40GP 4963pcs/40HQ Our service: sample If we have storage,it's free for you OEM We accept it and welcome it. after-service Any question,any doubt,we will communicate with you positively Company information: Welcome to our factory!!! sample shop: work flow: Manufacturing shop: Brief introduction: Qingdao Winners Corporation ( International Trading company ), Qingdao Newkings Corporation ( Domestic Production industry ) was established in 2005. High quality is what we are persuing,which is the most important feature in our We are specialized in manufacturing any size of PU Foamed Tires ,from 6 inch to 12 inch for baby stroller wheel,balance bike wheel,from 12inch to 20 inch(x1.75 and so on) for bike tire,tool cart wheel,from 20inch to 700mm(x1.75 and so on)for bike wheel,racing wheel,(see the rims below)from 6 inch to 18 inch(like 3.50-8.18x8.50-8) for wheelbarrow wheel,air compressor wheel,gargen wheelbarrow wheel,lawn mower generator wheel,cleaning machine wheel,handtrolley wheel,tool cart wheel,mixer wheel and other machine wheel. 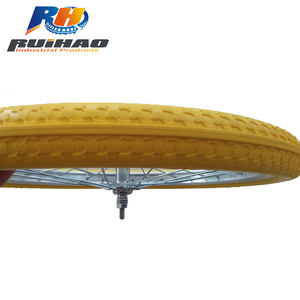 Alibaba.com offers 3,156 foam wheel for bicycles products. About 22% of these are material handling equipment parts, 11% are ride on car, and 1% are tool case. A wide variety of foam wheel for bicycles options are available to you, such as free samples, paid samples. There are 3,160 foam wheel for bicycles suppliers, mainly located in Asia. The top supplying countries are China (Mainland), Taiwan, and Turkey, which supply 99%, 1%, and 1% of foam wheel for bicycles respectively. Foam wheel for bicycles products are most popular in Western Europe, North America, and Mid East. You can ensure product safety by selecting from certified suppliers, including 245 with ISO9001, 55 with Other, and 9 with ISO14001 certification.